Following last year's release on NAFF, ANF hit the West Coast with four tracks of lush, trance-inducing digital bubblebaths on Pacific Rhythm. You might know this Montreal duo already: after lingering around under a different name, Dust-e-1 burst onto the scene last year with two 12-inches of blazing junglist workouts, while Priori has established himself as a keen collaborator, partnering with the likes of Project Pablo, RAMZi and Ex-Terrestrial. 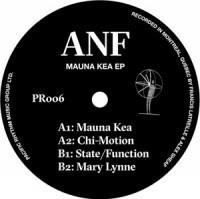 Their work together as ANF is some of their most distinctive, and on "Mauna Kea" the two producers explore the outer reaches of their sound, going on an expedition through pulsating acid lines, blood-rushing breakbeats and cosmic synths, with melodies that linger long after they're gone. The title track is a sleek and slippery acid-flecked cut charged with hints of progressive house, while "State Function" looks back to the Sputnik missions of early '90s Biosphere, with floating breakbeats and space shuttle chatter. The other two cuts are primed for the chill-out room, the after-hours kickback or any place where there's a lava lamp and a beanbag chair, from the hand percussion-driven groove and celestial pads of "Mary Lynne" to the leisurely breakbeats of "Chi-Motion." All four tracks offer rich, space-age techno to take your dancefloor somewhere in the past that feels like the future. Matt says: One of those annoying instances where, by the time you read this, said record may well be sold out of sheer momentum over the counter. Oh well, there's always next time.